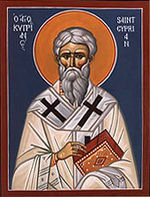 Almighty God, We arereminded Through your servant St. Cyprian of Your Spirit always within us and Your continued presence in us, and of our oneness with You and the Church. May we always grow together and profess You in Faith, Unity, and Hope. Guided by the Holy Spirit, we ask this through Christ our Lord. Amen. Almighty God, who gave to your servant Cyprian boldness to confess the Name of our Saviour Jesus Christ before the rulers of this world, and courage to die for this faith: Grant that we may always be ready to give a reason for the hope that is in us, and to suffer gladly for the sake of our Lord Jesus Christ; who lives and reigns with you and the Holy Spirit, one God, for ever and ever. Cyprian was a wealthy aristocrat and a cultivated rhetorician from North Africa. He converted to Christianity around AD 246, and by 248, he was chosen Bishop of Carthage. A year later under the persecution of Emperor Decius, Cyprian went into hiding. During his absence, he corresponded with his Church and directed it with wisdom and compassion. Regarding the matter of what to do with those whose faith had lapsed during the persecution, Cyprian held that they could be reconciled to the Church after suitable periods of penance; the gravity of the lapse determining the length of the penance. His moderate position at the time was one that prevailed in the Church over that of the rigorist Novatian, who led a group into schism at Rome and Antioch over this very question. During another persecution of Christians, this time under the Emperor Valerian, Cyprian was placed under house arrest in Carthage. On September 14, AD 258, he was beheaded. Many of Cyprian’s writings have been preserved. His letter No. 63 contains one of the earliest affirmations that a priest, in offering the Eucharist (“the sacrifice”), acts in the place of Christ, imitating his actions. St. Cyprian was a complicated man of conviction, learning and compassion. Like all of us, he made mistakes and despite whatever challenges life presented sought community, connection and hope. There’s a lot we can learn from the past, from the stories of Saints, even those we might strongly disagree with, here are a few impressions that emerged for me as I recently reflected on the life and writings of the peculiar St. Cyprian, ideas that might be helpful to us today.